What happens when you put an egg in a glass of regular water? This is a cool way to learn about density. 1. Pour water into the glass until it is about half full. 2. 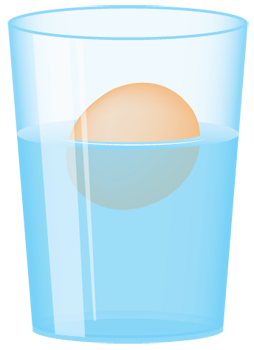 Place an egg in the glass of water and see if it sinks or floats (it should sink). 2. Stir in lots of salt. Start with 1 tablspoon and stir it until the salt dissolves. Keep adding more salt until the egg floats. 3. Next, carefully pour more fresh water until the glass is nearly full (be careful to not disturb or mix the salty water with the plain water). If you’re very careful, you can get the egg to float between the fresh and saltwater! The egg is denser than the fresh water (more molecules per square inch), this causes it to sink. When you start dissolving salt in the water, this is increasing the density (adding more molecules per square inch). Eventually the water becomes denser than the egg causing the egg to float. When you carefully add fresh water again, this fresh water is less dense than the salt water so it floats right on top! Are there other liquids you can add to make the egg sink or float? What else can you dissolve in the water to make the egg float?